Travel to Alonissos. Fligths. Boats. Ferry timetable. It's a piece of cake to travel to Alonissos thanks to its proximity to Skiathos that have an international airport, and very good ferry connections with Alonissos. The charter flights touch down on Skiathos, and from there the trip continues by ferry to Alonissos. The airport on Skiathos has a very short runway which usually involves a stopover on the way home as the planes have to be refuelled. 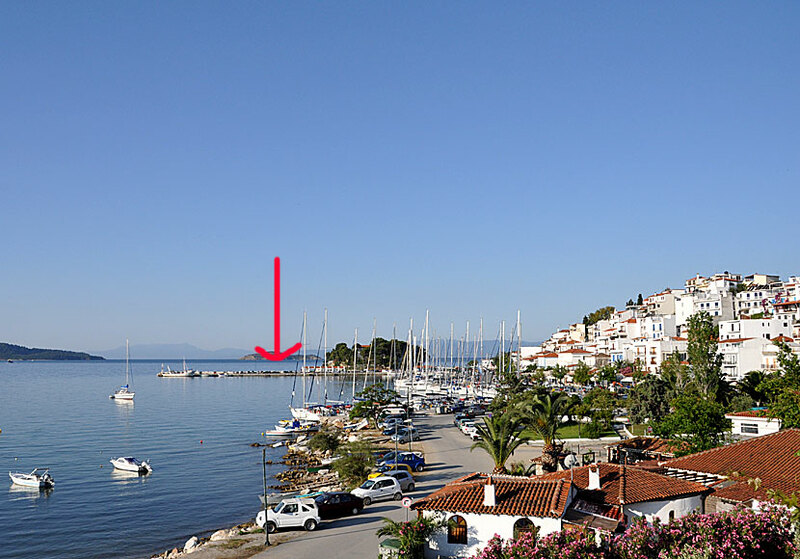 The port of Skiathos is below the red arrow. From there, the boats depart for Alonissos. The nearest international airport lies on Skiathos, so a easy way to get to Alonissos is to buy a spear seat on a charter flight to Skiathos. 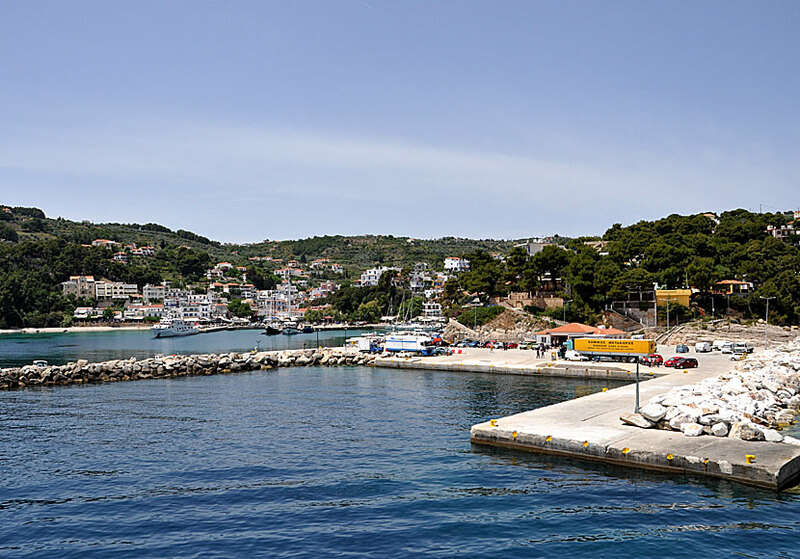 Take a taxi from the airport to the port, and travel on with the first boat to Alonissos. Boat tickets can be bought in any of the travel agencies in the port. The nearest domestic airport lies on Skiathos. From Skiathos you can fly to and from Athens. Alonissos has very good boat connections with Skiathos and Skopelos. During the summer months there are up to five boats per day to and from Skiathos and Skopelos. Choose between fast (and expensive) catamarans or regular ferries. Alonissos also has good boat connections with Volos and Agios Konstantinos on the Greek mainland, as well as a couple of departures a week to and from Kymi on Evia, and to Skyros. The port of Patitiri in Alonissos.